Sigh from the Blogger… Protecting against cookies and not leaving pawprints on the internet? Now that’s a really big bone to chew! What is On-line Privacy All About? It is all about keeping our personal information protected, secure and anonymous. In our physical world, we keep important papers and treasures, for instance, in fireproof containers or lock boxes in some “safe” place. We are careful to hide, to keep private the keys and the locations of our treasures. If we have a famous or beautiful persona, we wear disguises to protect it while in public; we hide from photographers or take great precautions to keep our whereabouts private and secret. So why do people invade our privacy? Because we have something that is valuable or profitable to “them” and the way to exploit us is to violate our privacy. Protecting privacy in the physical world can be a difficult if not deadly endeavor. In the online world, protecting our privacy is equally critical and difficult. We have a lot to lose as we become more dependent on the internet for just about everything we do. There is so much personal information in cyberspace about each of us and exploiters are vacuuming up this information for both benign and nefarious purposes. First-party cookies; third-party cookies; flash cookies; fingerprinting; householding – these are tracking methods used to gather information about us and our browsing habits without our knowledge or permission. This is the most discussed browser privacy protection feature. It sounds hopeful doesn’t it? You have the option to tell marketers that you don’t want to be tracked! This feature is available in the four top browsers at present, but Microsoft’s Internet Explorer 10 is the only one that enables this feature by default. Apple’s Safari, Mozilla’s Firefox have settings that can manually be set. Make note that Google Chrome was the last browser to offer the feature. And also be aware that it is not easy to enable this feature on any of the browsers. InPrivate Browsing is a feature Microsoft introduced with Internet Explorer 8. All later versions of this browser have this feature as well. The InPrivate Browsing feature allows you to “privately” surf the internet, meaning you won’t leave pawprints like which websites you visited. This feature is helpful to keep your web activities personal and private if you are using a shared or public computer. Firefox and Safari call this feature “Private Browsing”. Google Chrome calls it “Incognito Mode”. When an InPrivate Browsing session is begun, there is an identifying indicator on the address line. As long as the browser is open, InPrivate Browsing is in effect. Once that browser is closed, the InPrivate session is no longer in effect and all data including form data, passwords and history will be discarded from the computer. What is the Safest Browser to use for Privacy? Can Browser Add-ons provide additional protection? Since this is a blog about all things digital, I will ignore how I deal with the real version and focus on the digital kind. I am not a speedy typist on the keyboard. I couldn’t earn a living with my “typing” speed. So it is for that very reason that I don’t like the mouse — it slows me down even more. Think about it… You’re typing along; suddenly you have to make some move with the mouse in order to continue doing what you’re doing. You take your hands off the keyboard, grab the mouse, fidget around to position it where you need it to be on the computer screen. Then you have to decide whether you need a left mouse click or a right mouse click. And, oh, do you need to single click or double click it? Wow! I don’t know about you but that kind of time interruption puts me over the moon! So I prefer to use keyboard shortcuts whenever I can! Keyboard shortcuts allow me to leave my hands on the keyboard as much as possible while I’m “computering”. Shortcuts speed up my already slow typing speed. Shortcuts help keep me from going over the moon, and they enhance my memory capabilities. What could be better? So, what’s a keyboard shortcut? It is a combination of keyboard key strokes, that when pressed at the same time, perform an intended operation. For instance, consider the common functions of copy, paste, cut, print. If I’m on a Windows operating system computer and I want to quickly COPY a selection and PASTE it into another location, I highlight the selection I want to copy, press the “Ctrl” key and the “C” key at the same time to copy it; to paste the copied selection, I position the cursor at the insertion point, then press the “Ctrl” key and the “V” key. Voila! My copied selection is now pasted in the selected location. If I want to PRINT something, I just press the “Ctrl” key and the “P” key at the same time, and my PRINT menu appears. If I want to CUT some selection, I highlight that selection, then press “Ctrl” and the “X” key at the same time and my highlighted selection disappears. If I want to PASTE the “CUT” selection, I position the cursor at the insertion point and use my PASTE shortcut (Ctrl + V) and my selection appears (is “pasted”) at the insertion point. Quick and easy to do and to remember! There are so many keyboard shortcuts that it would take a few pages to list them on this blog. You’d lose interest and not finish reading the post. But there are a lot of places to find lists of shortcuts for both Windows and Mac operating systems. One place is on drop down menu lists. These menus display a function and its corresponding keyboard shortcut (if one exists). Open a drop down menu and see for yourself… Probably never even noticed it did you? I Was Browsing For…. And Now I’m Getting Ads For…. How Do They Know? itcat101	Chew On This, Security	Comments Off on I Was Browsing For…. And Now I’m Getting Ads For…. How Do They Know? I was taking my owner out for a walk in the rain the other day when I saw the coolest dog in our neighborhood sporting a new, bright yellow rain jacket. And, whoa, rain booties to match! Wow, what a canine fashionista that pooch was! I decided right then and there that I had to find myself some new doggie duds, so I went online to start my quest to update my pooch persona. “Wait a minute”, I thought to myself! DogGoneIt! How did they know those are things that I slobber for? Who told them? I didn’t… Or did I? Without getting really technical, when you browsed to throwmeabone.com, that cookie allowed their web servers to store information about you and your browsing preferences on your computer. That cookie also allowed those web servers to retrieve your info when you browsed to their site again in order to identify you. If none of this makes sense, don’t worry about it. Just keep in mind that cookies, from this dog’s point of view, are an internet marketing ploy to make us slobber while emptying our doggie banks. And come to think about it, wasn’t it a dog and his man that trained marketers to understand the slobber effect? Contactless credit/debit cards are any credit card sized cards that have embedded chips that store, process and communicate data via radio waves. They are called contactless because they aren’t swiped like conventional payment cards. They are generally WAVED, not swiped to complete a purchase or other payment transaction. For instance, you have a contactless payment card and want to get through a toll booth. You just WAVE the card at a payment reader, wait for the acceptance indicator, and voila! Transaction instantly completed and you just move right along. Wow, what speed! What convenience! No signatures, no PINs, no contact. Just wave and go. What could be easier to use? But the information contactless payment cards contain – what could be easier to lose? Lose? What do you mean, lose? Lose my secure card information? How can I lose it when I keep the card close to my body, hidden and secure in my wallet or purse or even underwear pockets? Yes you can lose it and here’s how… An identity thief, armed only with a scanning enabled smartphone that is aimed at your pocket, your purse or you, can find, read and harvest all of your card-held information – immediately — without ever making contact with you. The perfect pickpocket… electronically, without contact. You might still have your card but, actually, so does the thief… And with your card info, he can immediately make online purchases; or he can share your information immediately with fellow baddies, let’s say who are in Singapore, via smartphones. Then they too can go on spending sprees, right away with your card info. Gee, think of what these crooks can do in a crowded subway or shopping mall! Haven’t heard of contactless cards? Possibly not. But it is estimated that there are about 100 million contactless cards in use. VISA calls theirs PayWave; MasterCard named theirs PayPass; American Express’ is ExpressPay; and Discover calls their Zip. As I searched for information about these payment cards, I found that the card vendors cite how much more “secure” these types of payment cards are over conventional “cards”. There are even statements that there are no fraud activities reported. That is a bit of marketing malarkey, however. There are many reports about contactless card fraud and security breaches coming from the UK, Germany and Canada regarding this technology; and there are recorded demonstrations (done at security conferences) that frighteningly prove the real vulnerability of these cards. One possible reason there are no big news stories about fraud with these cards is that most of these card vendors allow signature free credit card transactions for under $25. Given these small charge amounts, it is easy for a victim to overlook fraudulent transactions when he checks his account activities — “crimes” that might not even be noticed. But for the crooks, they can have at it in a big way with even small amounts of money. Oh, did I mention that smartphones are now capable of doing “wave transactions” as well? What a vision, smartphones pickpocketing smartphones! Too bizarre to go any farther… But, if you want to know more about this technology and details about these cards, search the internet for RFID (radio frequency identification) or contactless cards. There’s a lot of info out there. My purpose is not to explain the technology, but rather, to alert us all to the vulnerabilities it presents to our security. Can’t you just picture this? High-pitched whining and glowing eyes coming from your pants or purse or? How could you not love having GuardBunny in your wallet right alongside all your identity? A warm and fuzzy where you least expected it! This post is only “something to chew on”. My purpose is not to discourage the use of contactless cards and devices. It is more to inform. If you like the convenience of these “cards” at least be aware of the price of that convenience and how to possibly protect against being electronically pickpocketed…. Can Cleaning Damage a Monitor? itcat101	How To	Comments Off on Can Cleaning Damage a Monitor? But doggoneit, wait a minute! Even though the internet recommends it and I’ve used it with some success, I also know it can cause damage to plastics! I know it because I took the finish off keys on a keyboard using IPA! So, even though it is highly recommended, can IPA hurt my monitor? Me oh my! What is one to believe? I believe, when in doubt, to err on the side of caution. I believe that experience trumps polyparrot advice. So when in doubt about cleaning monitors and TV screens, I thought it prudent to seek out the manufacturer’s advice. Always turn off the device and unplug the power cord from the wall or surge protector before cleaning. Always use a clean, soft microfiber cloth to wipe surfaces to remove dirt and dust. Always wipe in one direction to avoid streaks. NEVER use cleaning products, paper towels, tissues or other abrasive materials to clean screens. NEVER use alcohols or ammonia-based cleaners. NEVER use aerosol or liquid cleaners sprayed directly on the screen. NEVER use heavy pressure against the screen while cleaning. If smudges remain after wiping, then moisten a clean microfiber cloth with water, wring it out to remove excess moisture and gently clean the dirty area. For difficult dirt, Dell recommends a product called KlearScreen. Apple recommends a product called iKlear. Both products have good reviews and can be explored at http://www.KlearScreen.com. One suggestion from the Dell site was to frequently wipe dust from the screen with the clean microfiber cloth, but not to clean the screen too frequently, even with a recommended cleaner. Dell explained that excessive cleaning can eventually wear away the special coatings on the surface of the monitor that are meant to make your computing experience easier on your eyes. If sticky keys, spilled drinks, food crumbs, dust, cat hair, dog paws and unreadable keys have not been enough reason for you to consider cleaning that keyboard, then, maybe 400 times more bacteria might motivate you. OK, so it does motivate you! That’s Great! It does me too! But, doggoneit, what do I do about it? How do I clean my keyboard without doing damage to it? Do I need special cleaners? How do I keep it clean? My keyboard is so gross – should I just throw it away? You ask really good questions! To answer them I’d like to share some cleaning techniques that have worked for me and will not do damage to your keyboard. 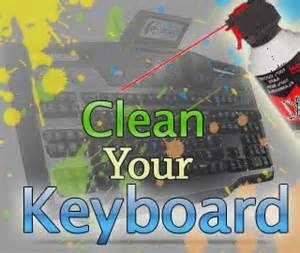 Although there are keyboard cleaning products on the market, you don’t need to buy any special supplies. Most will be things you already have and use in your household. And for that really disgusting keyboard that you think will defy cleaning and maybe ought to head for the trash can, I have one tip I love sharing. That will come last…. Unplug the keyboard from the PC or Mac. If a laptop, turn the laptop off and unplug it before cleaning the keyboard. • Blow out dust and other crud from the keyboard with a can of compressed air. o A hair dryer on high blowing also works well. It does not have to be on high heat. o Tilt the keyboard or laptop while blowing to have easier access to the underside of the keys. This also lets dirt and debris blow out of or fall away from the keyboard. o Don’t pour liquids onto the keyboard. Pour onto the cloth or Q-tips, then apply as cleaner. o If you do get too much cleaner on the keyboard, use the hair dryer to dry it. • Wipe the keys down with the cleaning solution until the grit and grime are removed. • Allow time to dry; then plug the keyboard in, start the PC or Mac and get back to work. If laptop, just start it up and work away. • Some sites recommend using antibacterial wipes regularly after the cleaning. • Remove the keys…. One by one. • I DON’T recommend this process for several reasons. The keys are not always that easy to remove; the keys and the keyboard can be damaged with this process; and you better remember how to put them back in the right places…. Keyboards vary. • It is ONLY for the wired standard keyboard that looks hopelessly filthy. • It is NOT for laptop keyboards for reasons that will be obvious. • It is NOT for wireless keyboards. • It is NOT for metal keyboards. • Have an extra keyboard on hand to use while this one dries. • Some techs recommend taking the back off the keyboard and remove the electronics . o I didn’t follow this advice. I just put mine in the dishwasher in its whole and dirty condition. I did this more than once, always with success. • Put the keyboard in the dishwasher. Run on quick cycle. Don’t use the pot scrubber cycle. • Remove and dry thoroughly. This may take several days (even up to 7 days). o Not doing so can cause shorting and damage to you and the devices…. Once you have a clean keyboard, you might consider purchasing a covering called a skin that will protect it against spills and dirt under the keys, yet not interfere with the touch experience that you have become accustomed to…. So that’s the DogGone down and dirty about cleaning up computer keyboards.